Guard Victor Oladipo and the Orlando Magic have won just once since New Year's Eve. The Orlando Magic own the fewest wins in the NBA since New Year’s Eve, but the injury-riddled Los Angeles Lakers haven’t fared much better. Each team figures to be happy to see the other struggling club Friday night at Amway Center in this matchup of likely lottery teams. Orlando (11-32) has won once in 13 games since Dec. 31, and the team’s overall record puts it at the bottom of the Southeast Division while ranking only better than Milwaukee in the league. Los Angeles (16-27) has managed just three wins in 12 contests since New Year’s Eve, and is percentage points ahead of Sacramento for last place in the Pacific. Dreadful defense is plaguing the Lakers during a 2-8 stretch. They’ve surrendered an average of 114.5 points and allowed opponents to shoot 48.4 percent in their last 10 games, getting outrebounded by an average of 8.4 per contest. Miami shot 57.7 percent while dealing Los Angeles a 109-102 loss Thursday, dropping the Lakers to 2-3 on this seven-game trip. "We really have to be better at communicating and get each other going and letting each other know where we’re at," said Pau Gasol, who had 22 points and 11 rebounds. "Let’s see if we can do that for the rest of the trip and forward." 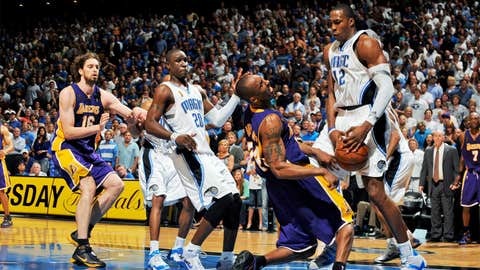 Gasol and Jodie Meeks are certainly doing their part. Gasol is averaging 22.0 points and 12.2 rebounds on 54.1 percent shooting over the past six games, while Meeks is scoring 18.5 per game in his last 10 after finishing with 22 on Thursday. Despite that production, the Lakers are having a tough time overcoming the absences of Kobe Bryant (knee), Steve Nash (back), Steve Blake (elbow), Jordan Farmar (hamstring) and Xavier Henry (knee). This will be the first meeting between these teams in nearly a decade without Dwight Howard being involved, and perhaps fittingly, both teams are struggling defensively. Orlando is allowing an average of 105.8 points over the past 13 games, and is 1-24 on the season when its opponent reaches the century mark. 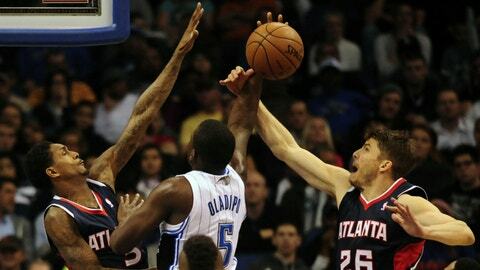 The Magic rallied from a 19-point deficit Wednesday against Atlanta to take a six-point lead in the fourth, but fell 112-109. "It’s tough for us to make shots down the stretch," said forward Tobias Harris, who had 19 points and 12 rebounds. "We had some good opportunities, we just couldn’t convert." Victor Oladipo is looking to build on one of his best performances of the season. The rookie guard hit 8 of 13 shots from the floor while finishing with 24 points, seven assists and seven rebounds. Jameer Nelson had 17 points and seven assists Wednesday, and is averaging 19.0 and 9.7 over the past three meetings with the Lakers. The guard scored 21 points in the most recent matchup, a 106-97 Los Angeles win in Orlando on March 12. The Magic are expected to be without center Nikola Vucevic for a 10th straight game due to a concussion.